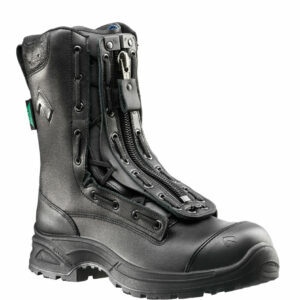 Black Eagle Athletic 2.0 T Low - SOS Safety International Inc.
Get the Black Eagle® Athletic 2.0 T Low from HAIX. 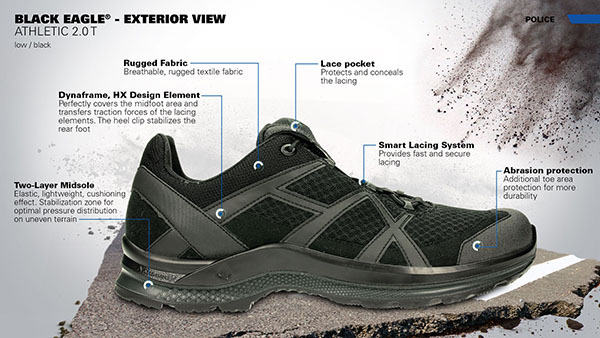 ✓HAIX® Anti Slip, ✓Smart Lacing ✓Microfibre/textile. 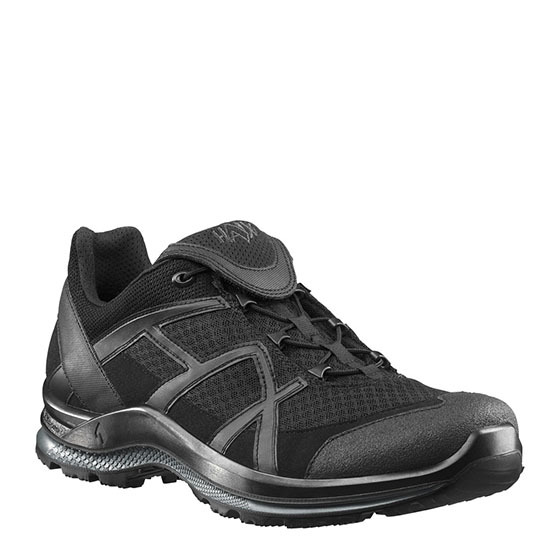 The HAIX Black Eagle® Athletic 2.0 T Low is lightweight, comfortable, and durable with many features you never thought you needed in a shoe. And because it’s metal free, you can wear it anywhere even when working around metal detectors. The sole of the shoe is made out of special rubber mixture for not only long-lasting durability but for exceptional slip resistance in any situation. The excellent multi-directional anti-slip grip allows you to run, stop, and turn in these shoes without having to worry about falling or slipping even on wet and cold surfaces. 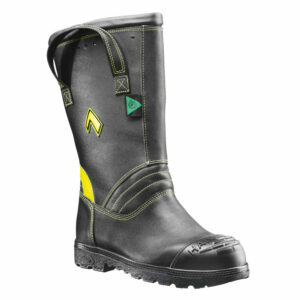 The durable rubber sole is not only heat resistant, but oil and gasoline resistant. It’s also cold insulating, non-marking and self-cleaning. The removable antibacterial insole is made out of a softly cushioned material to provide your feet with long-lasting comfort throughout the day. 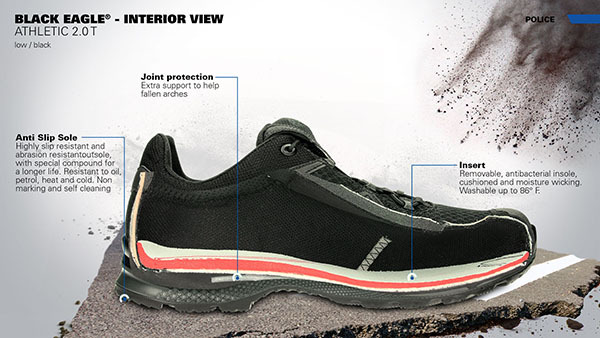 And even without GORE-TEX®, you are still assured of drier feet at all times thanks to the insole’s moisture absorbent properties and AIRFLOW channels. With a light microfiber design that’s extremely breathable, all parts of your foot will feel drier and more comfortable as you walk, run, or jump. The smart lacing system allows you to get in and out of your boots without having to worry about whether your shoelaces are tied or not. No more tying, no more knotted laces to ensure your shoes stay secure. Just tighten the slider and your shoes stay secure all day long. An added lace pocket stores your laces out of the way. 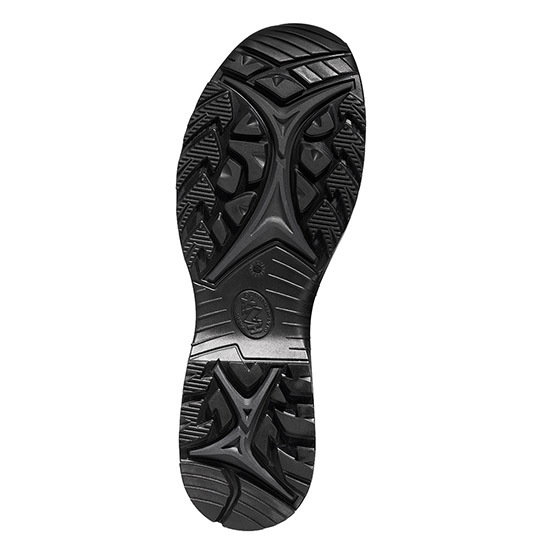 With the HAIX Black Eagle® Athletic 2.0 T Low, the lacing system not only prevents undue pressure on the feet, it helps ensure a perfect fit! 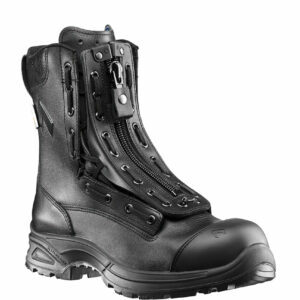 The HAIX Black Eagle® Athletic 2.0 T Low comes with an extended limited warranty if you fill out this online form. The warranty is for our customer’s added protection. But after trying on the boots, you might not have to look for any other footwear brand again.